Alonsi! As we take again to the roads and this time, it’s Argentina to which we go! I took three long distance buses in Argentina, two of them were night (yay!) buses. Bus travel in Argentina can be reasonably comfortable, although I still place Peruvian buses as the best I experienced in South America. Argentina is a big country and the distances are massive, which means that night buses are pretty hard to avoid. 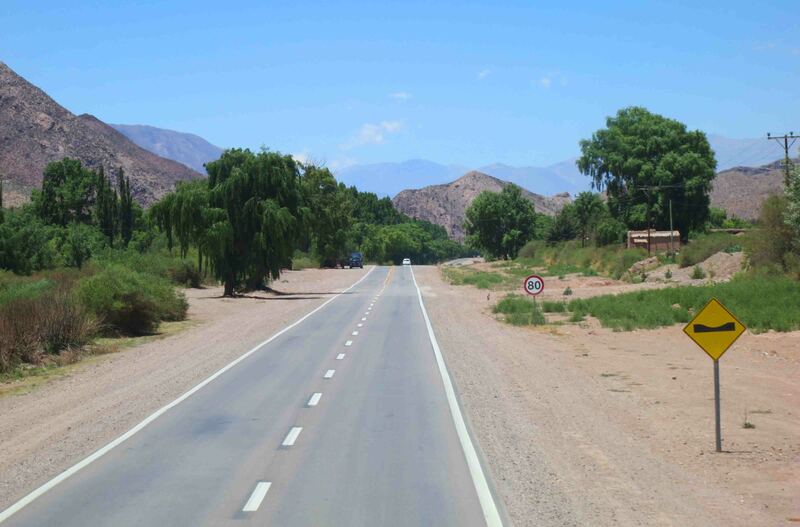 I originally had a plan to make my way down south to El Calafate by bus, but that would have meant over 48 hours straight in a bus and I pulled out of that idea and decided to limit my route to La Quiaca (border with Bolivia) to Salta to Buenos Aires to Bariloche in Northern Patagonia. It was the right choice. I would have had such little time in El Calafate it all would have been so rushed, and I was able to relax a little in Bariloche instead. The first bus ride though was daytime, from La Quiaca to Salta. La Quiaca certainly has the feel of an outpost, right on the border there, dusty and dry. It’s not a very big place, and neither is the bus station. 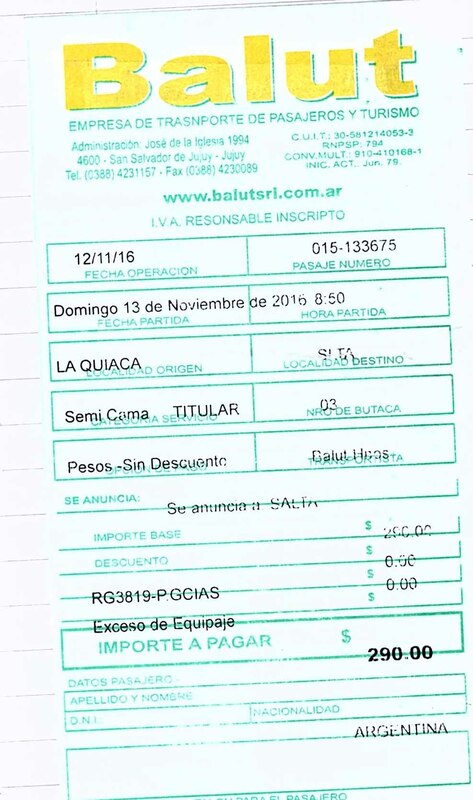 It took me a while to even work out which window/shop I needed to go to to get a ticket to Salta, but eventually I found the company ‘Balut’ who had a bus there that left just before 9am, getting in mid-afternoon. People boarded the bus with great sandwiches which was a highlight at an early stop. Which kept me going. It was four seats across and double-decker again. Bus condition was good, I was at the very front of the top level. The landscape changed as we went southward, becoming greener. And warmer, I guess we were descending over the journey. Sun in eyes a big problem at the front. It is clear very quickly that coming from Bolivia you are now in a more developed country. From Salta it was a long journey of nearly 24 hours to Buenos Aires, leaving at 12.45pm and arriving after 11am the next day. I bought the ticket online at it was just under 2000 Argentinian peso, a little under $140US at the time. The bus station is well set out and easy to navigate around, but then it isn’t so big. There are ATMs there too and I pulled some money out when I got into town. 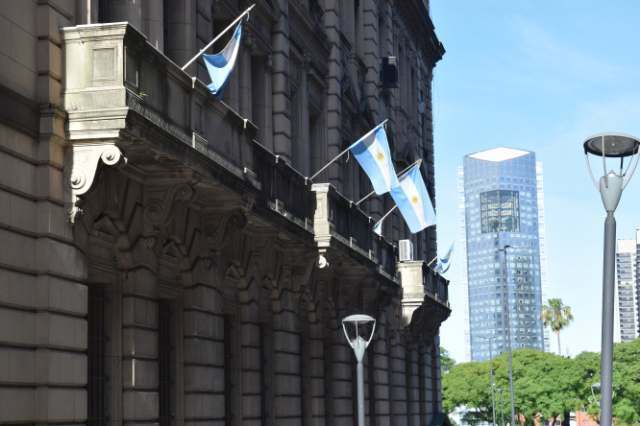 Charges are high in Argentina and they limit how much cash you can take at one time (just thought I’d include some handy info lol). I booked with the company El Rapido. The bus was, as always it seemed, another double decker. 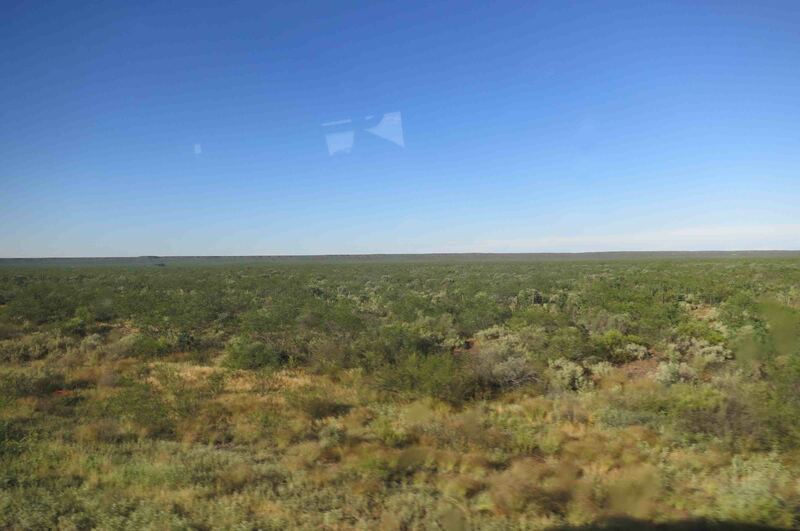 Actually, we were put into one bus and headed off – a different company, and a short while into our trip we pulled over at a service station somewhere and had to swap onto another bus – not as nice, and we had to tip to get our baggage transferred. Actually that’s a good point, in South America but especially Argentina a tip of a couple of bucks is pretty much expected for the guy loading and the guy unloading your bags. So keep some change handy or you might not see your bag again! I remember waking and the roads were now full on freeways with four or more lanes each way. It was really built up. And getting in from the outskirts of Buenos Aires to the Retiro bus station took a long time. Buenos Aires is a darned big place. The Retiro bus station is its own world it is so big and busy with loads of shops and cafes and enough room for all the buses in the country I shouldn’t wonder. Well, okay, no but there were like 30 – 40 bays. I found the area a little creepy and there are a lot of people about, so it’s a spot to really watch your valuables and not flash them about at all. There are info booths and you can book Remises from a couple of offices there – they are prepaid taxis which some recommend as a safe option. Still, even with information at hand it can be difficult to find the company you’re looking for. I found ‘Via Bariloche’ on the top floor. 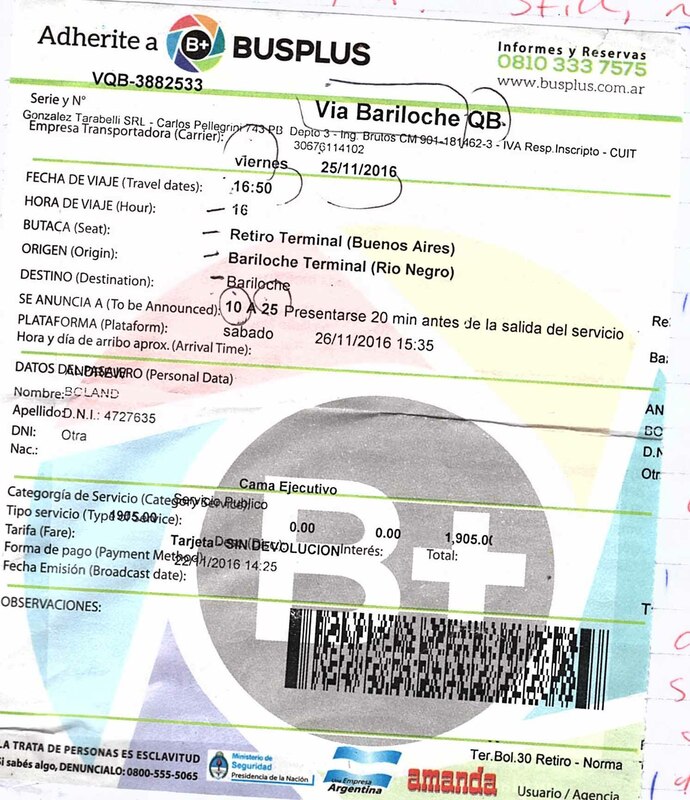 The fare from Buenos Aires to Bariloche was around $140-$150 US for a seat on the bottom part of the double decker bus, nearly three times what a trip of comparable timing (18 or so hours) would cost in Peru. The bus then was significantly late, like well over an hour. And it was very difficult to know what was happening as there were few announcements and those were in very fast Spanish. There was a departure board but that gave no indication of when the bus would be leaving. I was worried somehow I’d missed my bus – even though I’d been standing there looking at all the buses come and go from an hour before the bus was due to depart. Finally I asked someone who just happened to be on my bus who told me it was late. Out the window on the way to Bariloche. The bus was quite nice, very similar in layout to the Peruvian Oltursa buses. It seemed to take even longer to get out of Buenos Aires. It was a long long trip to Bariloche, incredible changing scenery on the way. There was a morning stop for breakfast and a break at a bus station somewhere… it must have been at least half an hour as I had to check my emails at the internet café there. So that was handy. Bariloche’s small bus station has a few info booths, but they were closed when I arrived as it was a weekend. Via Bariloche delivered okay service but were terribly late. Comfortable though, and we got to the destination in the mid-afternoon so still plenty of sunlight (hate arriving by bus at night). Argentina has a rail network. It’s not extensive by any means and isn’t always running, and on top of that most wouldn’t think of taking it because it’s much slower than the bus. I was a bit disappointed by buses in Argentina, I imagined from what I had heard that they were great, but they were seriously expensive and not quite as good as the best buses I took in Peru. But still, it’s a very solid network that covers a very large country very well. Thus concludes my review of the buses in South America (Ecuador, Peru, Bolivia and Argentina). Thanks for reading – May the Journey Never End! I’ve heard really good things about the long distance buses in Argentina so I’m surprised that you were disappointed. One place that impresses me incredibly when it comes to bus service – Mexico. Of course it depends on the company but on average they’re great quality and good prices. Actually maybe the best I’ve taken anywhere.